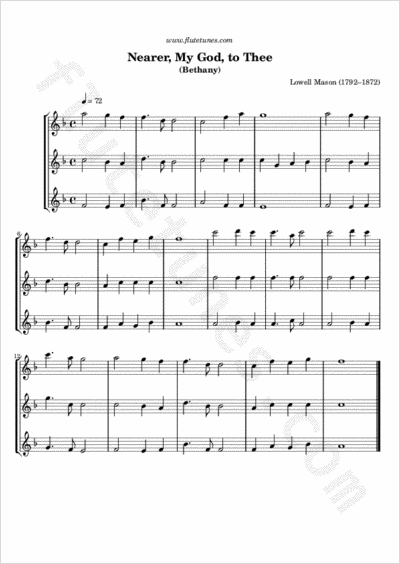 Although many different musical settings of “Nearer, My God, to Thee” exist, the hymn is generally sung to the 1856 tune “Bethany” by Lowell Mason. Mason's version is commonly associated with the RMS Titanic, as one passenger reported that the ship's band played the hymn as the Titanic sank. The “Bethany” version was also notably played by the ship's band in James Cameron's 1997 film Titanic. The composer Sigfrid Karg-Elert, moved by the Titanic tragedy, wrote six works based on Mason's setting, including an organ fantasia. The same setting is also quoted in Charles Ives's fourth symphony. The tune was also played at the funerals of former United States Presidents James Garfield and Gerald R. Ford.